Here is a question that we have received quite a bit recently... what do I do with old fire extinguishers so that I can dispose of them properly? 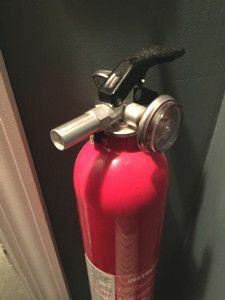 Fire extinguishers are dated with an expiration date about 10 years after you buy them and, as a result, many of us have 1 or 2 of these old fire extinguishers sitting around the house. Unfortunately, disposing of them is not as easy as tossing them in the trash. You must first discharge them! Here are our recommendations. #1. Go to a unused, or "scrappy", area of your yard and discharge the fire extinguisher as you would normally. Fire extinguishers are filled with sodium bicarbonate, which is the whitish material that blankets the would-be fire. This foamy material will vanish in time, so if you spray it over an area of your property that is out of sight, it should not cause any harm. #2. If you prefer to avoid the mess of discharging a fire extinguisher, then option #2 is to flip the fire extinguisher upside down when dispensing. With this method, you will remove the pressure without discharging the sodium bicarbonate. Once you remove the pressure from the unit completely, you may put the fire extinguisher out for the trash pick-up safely! Hope this info helps! Thanks for reading everyone.